Definition at line 6 of file QuestConditionScript.h. Definition at line 3 of file QuestConditionScript.cpp. References comment(), myComment, myName, and name(). Definition at line 9 of file QuestConditionScript.cpp. Definition at line 17 of file QuestConditionScript.cpp. Definition at line 12 of file QuestConditionScript.cpp. Referenced by CREPrePostPanel::createSubItemWidget(), and QuestConditionScript(). Definition at line 19 of file QuestConditionScript.h. Referenced by comment(), and QuestConditionScript(). Definition at line 18 of file QuestConditionScript.h. 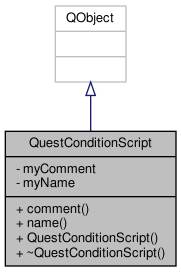 Referenced by name(), and QuestConditionScript().